U.N. digital privacy investigator: Estonia’s Katrin Nyman-Metcalf is passed over for the new position. 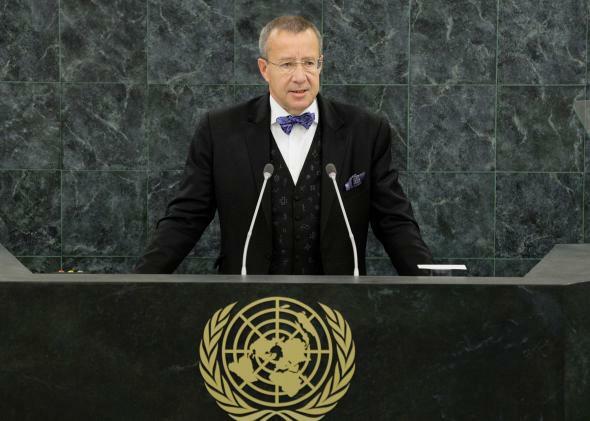 President of Estonia Toomas Hendrik Ilves speaks during the U.N. General Assembly on Sept. 25, 2013, in New York City. Katrin Nyman-Metcalf seems like the perfect person to serve as the United Nations’ first digital privacy investigator, a position proposed by Germany and Brazil and approved unanimously by the U.N. Human Rights Council last March. She is a professor of international and comparative law and chair of law and technology at Tallinn Law School in Estonia. She has served as a consultant to the European Union and OSCE, and has led EU-driven projects to support the development of information, communications, and infrastructure in Serbia, Albania, and Kosovo, among others. And she was indeed the pick made by a “consultative body” of five ambassadors, who made the choice based on three criteria: competence, gender balance, and regional representation. On Thursday, however, she was blocked for the post. The Human Rights Council’s German president, Joachim Ruecker, said he was instead proposing Malta’s Joseph Cannataci, as there were “[c]oncerns … as to whether [Nyman-Metcalf] was the best qualified candidate for this position.” Some felt that, as an Estonian, she would or could not be critical enough of the United States. Further, Nyman-Metcalf told Reuters that Ruecker had given her the impression that she had not been supportive enough of Edward Snowden. She was also criticized for having said in the past that there is no such thing as total privacy. The fact that Nyman-Metcalf’s Estonian nationality might have counted against her is a little strange. If there is one country in the world today that is proactively exploring how to balance privacy with digital innovation, it is Estonia. As of January 2012, almost all Estonians have ID cards containing a chip with information on the card’s owner and two certificates: one to authorize the holder’s identity and one to render a digital signature. These cards allow Estonians to bank, vote, and buy public transportation tickets online. The two certificates allow them to feel secure when doing so. This is also why, as even Jeb Bush knows, nearly 95 percent of Estonians file their taxes electronically and in a matter of minutes: Estonians are given tax forms pre-filled with their data but have enough Internet accessibility, literacy, and security to trust in and use the system. Further, though Germany and Brazil proposed this particular post, it is Estonia that has consistently championed cybersecurity and digital stability in the international arena, and not only by becoming the first country to offer e-residency. (In the interest of full disclosure: It is an offer that Slate’s Joshua Keating has accepted.) The country is a founding member of the Freedom Online Coalition, a partnership of governments trying to work toward Internet freedom. And last September, in an address to the U.N. General Assembly, Estonian President Toomas Hendrik Ilves said, “The Internet must remain a universal platform for uninhibited exchange of information.” He urged the U.N. both to recognize the significance of new technologies and “e-services” and to not sacrifice Internet accessibility in the name of the very real threat of cyberinsecurity. Estonia, then, would likely have been a natural fit to lead the way in digital privacy investigation at the UN. But Nyman-Metcalf and Estonia will not be leading. Cannataci and Malta will be. Malta’s good relations with Russia may well be immaterial, as Estonia’s with America may have been. And that the Maltese were less perturbed by privacy violations than other Europeans two years ago may be completely irrelevant to how Cannataci will do his job. However, on Friday the position of U.N. digital privacy investigator became couched in national characterizations and geopolitics. The qualified woman from a country that established a platform for the job will not be the one doing it, and the position may well become both more politicized than it needed to be and less prominent than it could have been.